It’s Throwback Thursday so let’s go back through Upper Deck’s trading card history and come up with a fun giveaway. The first round of the 2014 NHL® Draft™ begins tomorrow and reality is setting in for top prospects like Michael Del Colle, Leon Draisaitl and Samuel Bennett. These guys are hoping for the outcome that Sidney Crosby received in 2005 when we was chosen as the overall No.1 pick to the Pittsburg Penguins. So let’s put up a throwback card and see if our fans can come up with some great captions for the card! Please share your comical caption to this card for your opportunity to score the below 6-card set from the 2013 NHL® Draft and 5 packs of 2013-13 NHL® SP Authentic! Score this 6-card set from the 2013 NHL® Draft and more! You have until Friday morning, June 27 at 8:00 a.m. PT to post your caption before this promotion is closed. I’m really not sure what’s more uncomfortable….. holding a puck that is on fire or wearing a hockey jersey over my shirt and tie??? Guess he never thought he be on fire…. The puck is burning! Take a photo fast so I can stop smiling and start screaming! In 2005, Sidney Crosby caught draft stock was HOT! He was known for his flame shots where the puck appeared to be on FIRE. First overall draft pick gets to hold the “FoxTrac” Puck! Eat your heart out Katniss! Mom, am I old enough to play with matches? I dont always hold a puck on fire..but when I do..I get drafted 1st overall!! Where do I see myself in 10 years? I’m still going to be this hot! I think I’m the hottest 1st overall pick, eh. 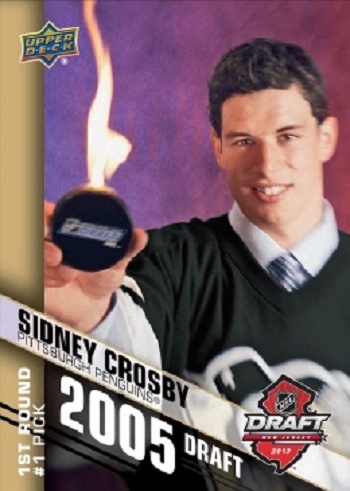 Sid the Kid… torching the competition since ’05. Look at this puck fellas. It is flaming hot and costs $12.7 million and if you call now, We will include a Stanley cup with this offer! It’s not even Hockey Season, why does the dude keep on liking Alex Ovechkin. Maybe I should just let it go. But first, Let me light a puck on fire. Hey Sid, got a light? I’m so good that I can set anything on fire in this world just by touching it. Um I can’t use this puck it will melt the ice. Look mom, Gretzky gave me a flaming puck because I am going to be the next Great One! For igniting the NHL with dazzling plays, turning players inside out & stealing hardware such as the Stanley Cup, Hart Trophy just to name a few. Congrats to Jammy Louie for scoring a 6-card set from the 2013 NHL® Draft and 5 packs of 2013-13 NHL® SP Authentic! Thank you to everyone for participating and look forward to seeing your witty comments next week.